Another of David Crystal’s wonderful little books jumped at me from the shelf of my local bookseller: this time it is Words in Time and Place, Oxford UP, 2014, £16.99 or $27.95. Its ISBN is 978 0 19 968047 4. The plot is again simple, brilliant, and completely absorbing. The Oxford English Dictionary (OED) is a vast and definitive work of definition, etymology, etc. So a team assembled a historical thesaurus to it, which was published in 2009. Sadly it is a massive two volume work, and although well priced, it is very expensive (£275) – not the sort of book to buy on a whim, nor to try carting around with you. So David Crystal has produced an enhanced set of excerpts from it. These consist of lists of English words, in order of their first recorded occurrence in the language (including Old English), of similar meaning. So for terms of endearment, the thesaurus (and this little book) starts with darling (Old English) and belamy (c 1225), progresses through whiting (c 1529), and reaches lamb-chop (1962). Crystal adds considerable value by providing an often witty account of the etymology of each word, turning the book into a sort of informal dictionary in its own right. My friend, could you please tell me how much money I would need for a snack for the tipsy call-girl with a big nose that I have in the toilet of my hotel? My cocky, could you please tell me how much gingerbread I would need for an undern for the nazzy marmalade madam with a big nozzle that I have in the closet of ease of my posada? Like so many of David Crystal’s books, this is seriously addictive, and essential for anyone with the slightest interest in the English language. It could be indispensible for those writing historical fiction, perhaps, and its section on pop music is the best short guide to terminology that I have seen. 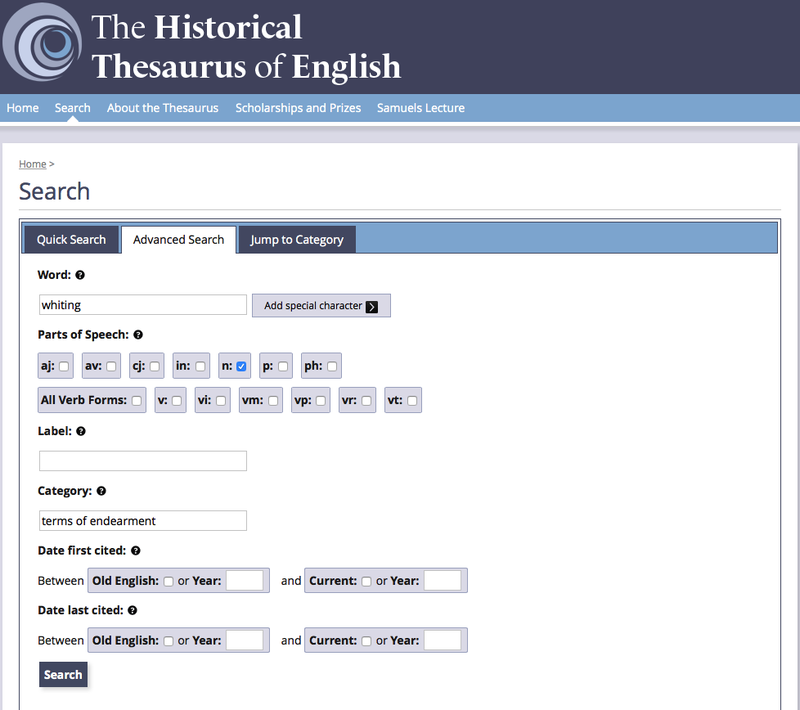 As he points out, the full historical thesaurus is now free to access, although to get the most out of it you will also need a subscription to the online OED itself. Point your browser here, and you can use its simple or full search facility to obtain a chronological listing of synonyms. 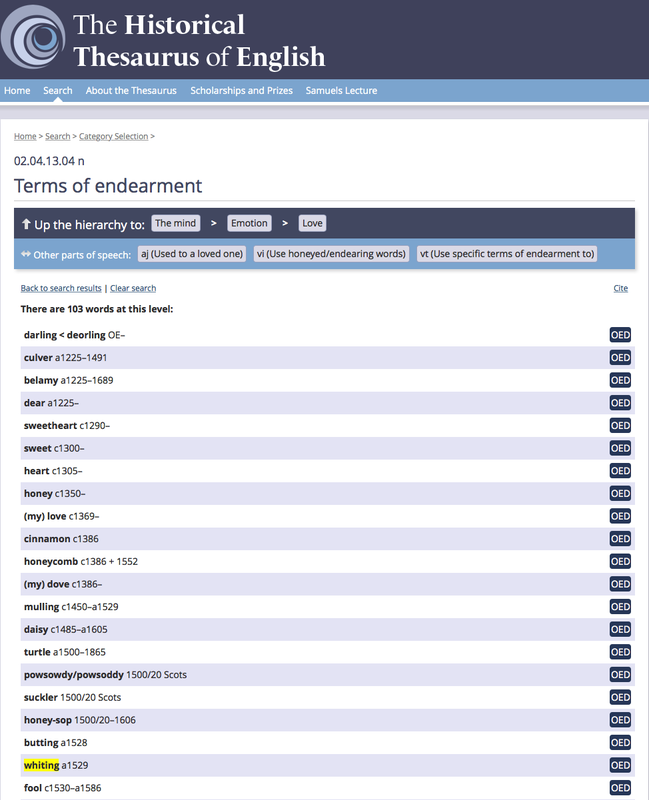 Each then offers a button which – provided you have online OED access – will transport you to the word’s full entry in the OED itself. Enjoy, or should I say wallow and gladden! Posted in General, Language and tagged dictionary, English, language, thesaurus. Bookmark the permalink.